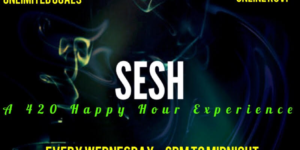 A 420 happy hour experience each and every Tuesday starting May 9th! Join us from 6 until midnight for cool vibes, relaxed music, infused hookah and an elevated atmosphere. Feel free to bring flower, vapes, enails and edibles to enjoy and share! It’s legal in DC. This is an initiative 71 compliant event.